These one of a kind tapestries will help transform your room into your private sanctuary! 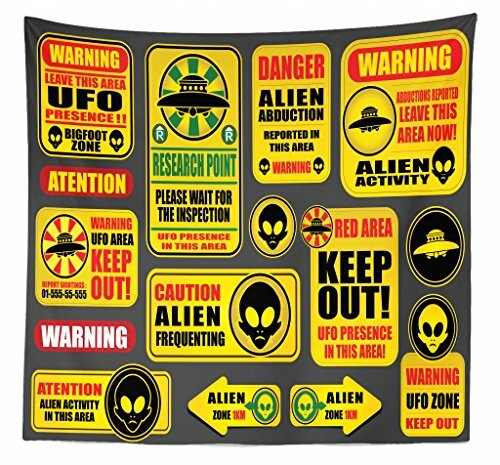 SIZE: Queen Size - 88" W X 88" L. MADE FROM: High quality 100% Microfiber - lightweight, very soft, cloth fabric. Includes a 1.5" rod pocket. Environmentally friendly, no dye substance harming health of your family. With high resolution pictures it will bring a 3D like realistic experience, adding a great perspective & completely changing the look of a room. You can either hang it on your wall or use it as a throw or bedspread. Decorative and versatile. Perfect gift idea for your mother, father, sister, brother, grandma, grandpa, wife, husband, son, daughter and all other beloved ones with 10's of thousands of surprising designs. You can find a theme for everyone with any interest in our Lunarable Amazon Collection. Enter into a new world with this art tapestry, it can be at a seashore scene or meditate with a mountain landscape scenery. If you're a fan of sports or have a hobby of any kind, you will be spending time with it in your own personal space. Customized, personalized products are very popular. As manufacturers of digital printed home textiles and decorations, we follow current trends and bring you the latest home fashion. Either a present to your family or best friend, fiance, parents, grandparents, boyfriend, girlfriend, grandson, or to yourself, the item should be interesting & authentic. Men, women, kids, teens, boys, girls will love this item! The digital images we display have the most accurate color possible, however due to differences in computer monitors, we cannot be responsible for variations in color between the actual product and your screen. Due to manual measurement, please kindly allow 1-2 cm discrepancy. CARE INSTRUCTIONS: Machine wash with cold water; Do not bleach. Tumble dry on low heat. Iron on low/medium heat. You can easily hang the tapestry up with pins or a rod up to 1.5" in diameter. No hardware is included. QUEEN SIZE - 88 INCHES WIDE x 88 INCHES LONG. Wall hanging, wall decor, throw, bedspread, bed cover.